“Overcoming ADHD without Medication: A Guidebook for Parents and Teachers” is a collaboration of information published by the Association for Youth, Children and Natural Psychology. The New Jersey non-profit organization is dedicated to promoting positive self-help and natural solutions as well as providing resources for parents and educators. The book is a compilation of ideas and life work of various health professionals in the field. The topics explored in the book include understanding what is ADHD, the side effects of certain medications, ADHD behavioral issues as well as looking into solutions for parents and educators to explore at home and at school. 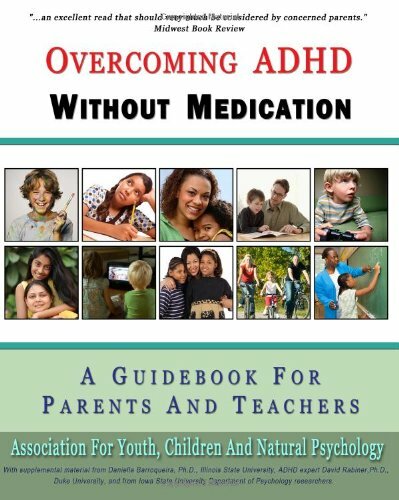 If you are a parent, and you have been told that your child has ADHD or you suspect they may have ADHD, and you want to do some research on the subject, then reading “Overcoming ADHD without Medication: A Guidebook for Parents and Teachers” can help you with understanding some of your choices. Realizing that medication does not have to be your first and only choice as an immediate reaction to what a doctor, teacher or another parent may tell you can be a huge relief. Readers of “Overcoming ADHD without Medication: A Guidebook for Parents and Teachers” can find a wealth of information available to them in this book and can tailor a program specific to a child’s needs. There is, however, one important note that I wish to restate from the book: “Readers are encouraged to gather as much information as possible from a variety of reliable sources when making medical choices involving mental health, evaluate the options and make informed and balanced decisions.” I liked this comment because this book is not a ‘one size fits all’ and will not have all of the answers for everyone. There are plenty of other alternatives not found in this book, but I did appreciate the book for what it did have. As a parent with two ADHD children, I can say that medications, alternative therapy and finding what works can change over time. In reading, “Overcoming ADHD without Medication: A Guidebook for Parents and Teachers,” the book was helpful in two ways:&nbsp;First, it provided an extended amount of information around ADHD and had good solutions and alternatives that parents and teachers could implement at home and in the classroom.&nbsp;Second, it contained an extensive listing of resources that can always be used as a go-to guide whenever needed.&nbsp;Having a book that has points of reference, an extensive list of bibliographies and checklists can be beneficial. Overall, I found “Overcoming ADHD without Medication: A Guidebook for Parents and Teachers” easy to read and not too clinical.&nbsp; It was well worth the time to read. Thanks Associate for Youth, Children and Natural Psychology! This entry was posted in Books, Medicine & Health Sciences / Psychology, Non-Fiction, Self-Help and tagged Association for Youth Children and Natural Psychology, Book Review, Overcoming ADHD Without Medication. Bookmark the permalink.